The Ballroom at The Dewberry is a modern expression of a classic, grand ballroom. Step into a vision of beauty prepared and thoughtfully curated to envelop the sense of luxury, warmth, and elegance for all who enter. The central focal point of the room, the Viennese-cast brass and crystal chandelier housed in 16 feet troweled plaster ceilings, balances the scape of antique mirrors, French doors, Douglas Balentine artwork, and the Walled Garden that awaits beyond. The chandelier is a Josef Hoffman design from 1914, produced by Woka in Vienna, Austria. It is composed of multiple cast brass armatures and crystal. It was created in this size for the first time for the hotel. The wall sconces are custom glass fixtures created by Urban Electric specifically for The Ballroom. The floor is a large scale interpretation of a parquet pattern that can be found at Versailles, and is composed of a series of large White Oak planks. A nod to old Charleston. The ballroom houses 1,800 square feet of space, accommodating events up to 160. Looking beyond the classic Charleston ballroom is the Walled Garden, containing 2,250 square feet of stunning space. The Charleston live oak, ivy covered historic brick walls, and bluestone walkways make the garden the ideal space for any gathering. This unique space accommodates 150 guests. In combination with the adjacent Ballroom, the joined spaces can accommodate 300. The entrance to The Ballroom, the Swanston Room can be used as a group registration area. 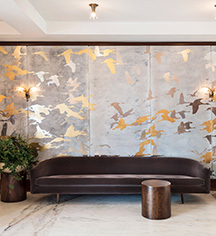 A second installation by John Dewberry and Thomas Swanston, this room features a gold, silver, and platinum leafed art consisting of Whooping Cranes and Sand Hill Cranes taking off on the left and landing on the right. 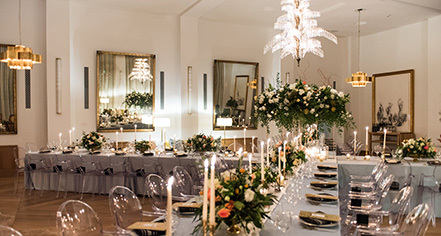 To light the space, Woka chandeliers and sconces from Vienna, Austria fill the room. The restrooms are marble clad with hand-selected Danby Vermont marble and feature cherry paneling with brass accents. The first collaboration of Swanston and Dewberry sits in the lobby of Campanile, the 28-story office tower on Peachtree Street in Atlanta, Georgia. This installation received a national award.